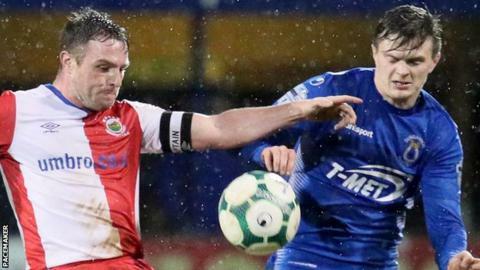 Irish Premiership pacesetters Linfield's match away to Dungannon Swifts on Friday, 22 March is to be shown live on BBC Two Northern Ireland. The fixture at Stangmore Park will be crucial for David Healy's side as they attempt to regain the title, having finished fourth last year. Linfield will be aiming to complete a hat-trick of league victories over the Swifts this season. The Blues won 3-0 at home in September and 2-1 away the following month. The sides also met in a League Cup semi-final in December, Linfield going through 1-0 after Andrew Waterworth's extra-time winner. Before the Dungannon v Linfield match, there will be two other Irish Premiership games on BBC Sport NI. Title holders Crusaders' match against Glenavon is on Friday, 22 February, followed two weeks later by Glenavon at home to Linfield on Friday, 8 March. There will also be live Friday Night Football coverage of the Irish Cup quarter-final on 1 March between Larne and Coleraine.